As a new patient to the Universal City Medical Wellness Group, we urge you to attend our weekly health workshops, Tuesday evenings at 8:00 p.m.
We consider attending these talks, getting informed about your body and your problems to be a very essential part of your treatment. I have found that patients who attend actually have speedier recoveries, because they understand and help themselves to get well. They also gain knowledge to prevent future problems. There are seven different topics in the series. Total Health is the first and important to all of our patients. In this health talk we cover methods to reverse almost any illness and how to avoid the most dangerous health mistakes. 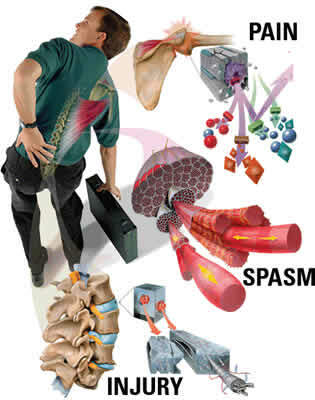 Vital information on the health of your nerve system and spine is covered. Next is Gland and Hormonal Balance. We address the natural correction of gland disorders (thyroid, adrendal, ovaries, testes, etc. ), how glands are balanced and how to restore them when they're in trouble. The third talk is Energy, Blood Sugar and the Zone. In this universally needed workshop, we cover the surprisingly broad effects of low blood sugar on health, nutritional breakthroughs for energy regeneration, and the newest research on how to eat for health and "The Zone." One of the most interesting and baffling causes of mid-back pain is from the blood-sugar control system. Because the nerves to the organs of blood-sugar control (pancreas, liver, and adrenal glands) travel out from this part of the spine, a person’s dietary error may trigger this type of spinal pain. The other day a patient reported a stabbing mid-back pain. On inquiring, she told us of eating her way through a whole bag of candy in one sitting (just before the pain started). Excess carbohydrate (sugar or starch) overload can cause this area of the spine to subluxate (go out of place, and irritate the adjacent nerves). The typical location is right around the center of the back (at about the height that a bra strap crosses a woman’s back). It’s an excellent idea to see a great chiropractor, if mid-back pain is making you nuts. Who else would be able to better figure it out? After all, your back pain isn’t caused by a drug deficiency! Universal City Medical Wellness Group (UCMWG) is a Multidisciplinary and Complementary Alternative Medical Group near Universal Studios, Studio City, Hollywood, North Hollywood, and Burbank, in L.A.
Canada Confirms Labeling of BPA “Toxic”"